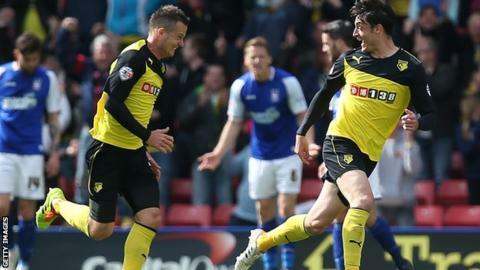 Watford kept alive their hopes of reaching the Championship play-offs and dented Ipswich's with victory at Vicarage Road. Albert Riera curled Watford into the lead, but Anthony Wordsworth levelled from close range after half-time. Ipswich needed a win to move into the top six, but in a three-minute spell Gabriele Angella's header and Lewis McGugan's strike dashed their hopes. The win leaves Watford five points off the play-offs with a game in hand. Giuseppe Sannino's side now have seven home wins from their last nine, but travel to fourth-placed QPR and third-placed Derby County in their next two fixtures. Brighton currently occupy the final play-off spot, but after the Seagulls, Bournemouth and Reading all dropped points on Friday, both sides at Vicarage Road had the chance to capitalise and stage a late play-off push. Ipswich, with four wins in six, began strongly and both Daryl Murphy and Jonny Williams tested Manuel Almunia in the early stages. Mick McCarthy's side enjoyed most of the early possession and territory but Riera's individual strike was the difference at half-time. The former Liverpool player, on loan at the Hornets until the end of the season when he joins Udinese, drifted in from the right before curling a right-footed shot past Dean Gerken. Despite playing some neat football, Sannino's side were unable to create another meaningful chance before the break and their visitors wasted no time in fighting back after it. Ipswich front man Frank Nouble went close, before swinging in a cross for Wordsworth to prod the equaliser, and his first goal of the season, on 50 minutes. With the visitors buoyed, Almunia was forced into a superb save to turn Luke Hyam's header onto the crossbar and Watford relief quickly turned to joy as they settled the contest in devastating fashion. No sooner had celebrations settled after Angella's guided header found the corner of Gerken's net, than McGugan profited from an excellent run and cut-back by Daniel Tozser to fire crisply into the corner, take the game decisively away from Ipswich and give Watford renewed hope that their season need not end in four games' time. Watford head coach Beppe Sannino: "I won't speak about play-offs but I'm delighted. We played a good game against a very good team and this gives more value to our victory. "What was important was win the game and to not concede a goal in the last 10, 20 minutes was good. "But what I would like to praise is the way we carried on during the game. We were able to bring the ball in their half and to play comfortably away from our box." Ipswich boss Mick McCarthy: "I think that the crossbar saved the game for them and then poor marking from a free-kick. "It was a great delivery from them. It was good movement and a good header, but no way should he get on the end of it because it should have been stopped. "You have to look after your own result, that's my mantra. Everybody else can do whatever they want. If we win, there's nothing anybody can do about it." Match ends, Watford 3, Ipswich Town 1. Second Half ends, Watford 3, Ipswich Town 1. Attempt missed. Sean Murray (Watford) right footed shot from outside the box is just a bit too high. Attempt blocked. Cristian Battocchio (Watford) right footed shot from the centre of the box is blocked. Assisted by Sean Murray. Corner, Ipswich Town. Conceded by Troy Deeney. Stephen Hunt (Ipswich Town) wins a free kick in the attacking half. Attempt missed. Stephen Hunt (Ipswich Town) left footed shot from outside the box is just a bit too high. Assisted by Paul Green with a headed pass. Corner, Watford. Conceded by Aaron Cresswell. Daniel Tözsér (Watford) wins a free kick on the left wing. Substitution, Ipswich Town. Paul Taylor replaces Jonathan Williams. Attempt missed. Frank Nouble (Ipswich Town) header from the centre of the box misses to the right. Assisted by Jonathan Williams with a cross. Jonathan Williams (Ipswich Town) wins a free kick in the defensive half. Attempt blocked. Troy Deeney (Watford) right footed shot from the left side of the box is blocked. Assisted by Joel Ekstrand. Substitution, Watford. Cristian Battocchio replaces Almen Abdi. Substitution, Ipswich Town. Paul Green replaces Anthony Wordsworth. Attempt missed. Lewis McGugan (Watford) right footed shot from outside the box is close, but misses the top right corner. Luke Hyam (Ipswich Town) wins a free kick on the right wing. Christophe Berra (Ipswich Town) wins a free kick on the left wing. Lewis McGugan (Watford) is shown the yellow card for a bad foul. Foul by Lewis McGugan (Watford). Attempt blocked. Daniel Tözsér (Watford) left footed shot from outside the box is blocked. Mathias Ranégie (Watford) wins a free kick in the attacking half. Goal! Watford 3, Ipswich Town 1. Lewis McGugan (Watford) right footed shot from the right side of the six yard box to the bottom left corner.